Get ready to #FuelYourFuture in 2019 with SHRM-Atlanta’s Rising Leaders! 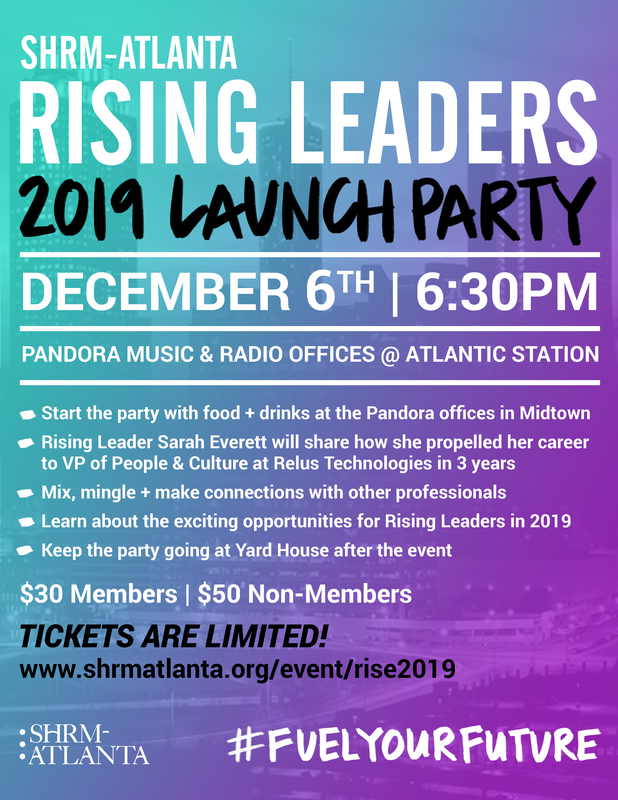 The Rising Leaders community offers a variety of opportunities for young professionals to connect, learn, and have fun - and we want you to join us as we kick off this new adventure! Tickets are limited - get yours now! It was never my plan to pursue a career in Human Resources, but I feel incredibly lucky to have stumbled into the wild, wild world of People Operations. I am endlessly curious about individuals, their experiences, and their motivations, and am driven by helping people reach their potential faster. In my role as VP of People and Culture, I have the honor and privilege of helping build and shape a work environment that I love— and that others do, too. In classic startup fashion, I get to wear a lot of hats, which include (but are certainly not limited to) recruitment, interviewing and hiring, onboarding, learning and development, internal communications, rewards and recognition, employee relations, community service and outreach, and employer branding. While my day-to-day activities vary across a wide spectrum of responsibilities, they are anchored by one fundamental mission: to create a workplace that keeps our employees engaged, challenged, and proud of what they do. Although I'm guided by lofty ideals, I gain the most satisfaction from turning ideas into reality and creating constructive change for other people.